As we all know, working in the field of long term care, we must assure that resident rights are always in focus and kept in high priority—along with the million other things we do every day. After all, residents are why we all became connected to, and remain in, long term care. One of the often-overlooked regulations dealing with resident rights is F-Tag 561–Self Determination. This regulation is to assure that residents have choices in every aspect of their life after admission to a facility. The resident has a right to choose activities, schedules (including sleeping and waking times), health care and providers of health care services consistent with his or her interests, assessments, and plan of care and other applicable provisions. The resident has a right to make choices about aspects of his or her life in the facility that are significant to the resident. The resident has a right to interact with members of the community and participate in community activities both inside and outside the facility. The resident has a right to participate in other activities, including social, religious, and community activities that do not interfere with the rights of other residents in the facility. Resident life after admission to a facility should not be any different than life prior to admission, in terms of individual rights. Each of the rights listed should be a matter of everyday life for all residents. So, for example, if a resident was someone who worked night shift all their life and is accustomed to sleeping during the day, shouldn’t that lifestyle need be accommodated? What do those type of accommodations mean in terms of education, services and care plans for this resident? These accommodations must be communicated clearly and consistently with all staff, by not only teaching the expectation or the “what” but also teaching the “why” of the need. Additionally, residents are entitled to choose to participate, or not, in the activities of their choice both within and outside the facility. Any other area significant to the resident. In researching citation data for F-Tag 561, since November 2017 when Phase II was implemented, it appears that 3 facilities nationwide have received citations of level “G” or higher for this regulation. The self-determination regulation should be common sense and a “no-brainer” when it comes to inspections. If person-centered care is truly a part of your facility operation, then this regulation should be relatively routine. Keep in mind that if F-Tag 561 is cited, the facility could also incur citations for F-Tag 550–Resident Rights or F-Tag 558–Resident Accommodations. Several other similar regulations also connected with F-Tag 561 are F-Tag 562–Immediate Access, F-Tag 563–Right to Receive/Deny Visitors and F-Tag 564–Informing of Visitation Rights/Equal Visitation Privileges. While F-Tag 562 and F-Tag 564 have not been cited since November 2017, there was 1 citation for F-Tag 563–Right to Receive/Deny Visitors which was a “G” level or higher. Visitors must have immediate access provided the resident has given consent to that individual to visit. Visitors include not only family members and friends, but also those connected to governmental agencies such as the Ombudsman, protective services, physicians, members of advocacy groups or resident representatives. Of course, visitors may be subject to restriction if they pose a clinical or safety risk to the resident. Facility policy must clearly be established and followed if this is the situation. Deficiencies with these regulations will become evident upon resident interviews by surveyors. Staff need to be attuned to any resident voicing concerns about having visitors restricted for any reason. Addressing these concerns prior to a survey is essential in order to keep these three tags from being cited. While the numbers of deficiencies of all four of these regulations are few, they could sneak up on a survey dependent upon conversations with residents. Be sure you know any issues connected with these regulations prior to commencement of a survey. Talk with your residents about how they feel about these regulations regularly. This will give the facility the opportunity to correct any issues prior to the resident having similar conversations with a surveyor. Like this article? 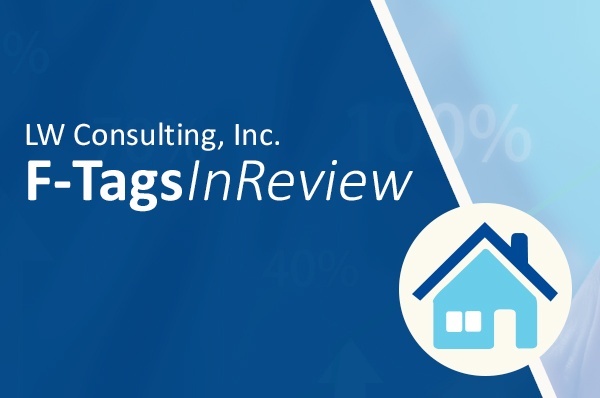 Sign up for the LW Consulting, Inc. blog to receive updates on additional articles in our ongoing F-Tags in Review series.